Support the educational mission of Texas A&M University (TAMU) through evidence-based professional development opportunities promoting proven and innovative instructional approaches aligned with faculty and student success. Recognize the integral value of diverse perspectives and inclusive teaching approaches; strive to ensure that all faculty, teaching assistants, and students, regardless of their identity, can excel. Click here to view the CTE Strategic Alignment document- updated July 26, 2018. 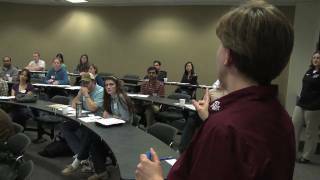 The Center for Teaching Excellence at Texas A&M University provides learning opportunities and professional development for faculty, staff, post-doctoral fellows and graduate students. Through face-to-face consultations, curriculum design/redesign, graduate teaching assistant training and professional development workshops, the center provides educators with the tools necessary to make an impact on the students they teach. The Association of Former Students provides nearly $150,000 annually to the Office of the Dean of Faculties to support programs such as this one, as well as many others. The faculty of Texas A&M University College of Veterinary Medicine & Biomedical Sciences (TAMU) recently embarked on a comprehensive curriculum redesign effort. This process was developed in partnership with the university’s Center for Teaching Excellence (CTE) and is based on their evidence-based model of program redesign (PRD). The Department of Ecosystem Science and Management (ESSM) had a problem: its curriculum had not been updated in a number of years. As the College of Agriculture and Life Science's leadership emphasized an increased focus on curriculum outcomes, administrators recognized an opportunity to hone the program and to develop innovative new methods to prepare work-ready graduates. The solution involved Texas A&M University’s Center for Teaching Excellence (CTE). Faculty members, Dr. Wendy Keeney-Kennicutt and Dr. Stephen Daniel share the impact of participating in CTE faculty professional development opportunities.